John M. Tait’s site Scots Scots Threip is an entertaining and provocative collection of well-agued articles about the cultural and linguistic context of Scots. 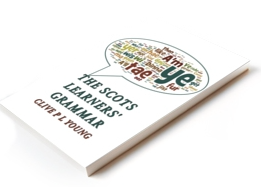 He discusses a range of very pertinent ideas about the nature of Scots, attitudes to the language and the evergreen issue of standardisation. Many of these notions are barely touched in the general discourse on Scottish culture and whether you agree with the author or not, they are an education in themselves. There was an interesting discussion recently on FB about one of his articles “Robersonianism’. The “Roberson” in question is James Robertson, a kenspeckle Scottish author of And the Land Lay Still, The Testament of Gideon Mack. He co-founded Itchy Coo, the largest publisher of books in Scots for bairns. Roberson edited and wrote an introduction for a collection of Scottish writing: A Tongue in yer Heid (1994). John sees this short article as a seminal conceptualisation of Scots from a prominent figure. He confronts what he sees as Roberson’s representation of Scots firstly as a “less than respectable register in tension with standard English” which should be maintained in that role and “Scots” as almost anything spoken and written north of the Border – a “non-definition of Scots”. Although perhaps little read, the text is claimed to be the articulation of a view of Scots “already – albeit tacitly – accepted in Scottish literary and academic circles”. By ma wey o’t, Robertson jist writes frae a scrievers staunpint. It’s no a manifesto an sicker no onie kind o langage policie. 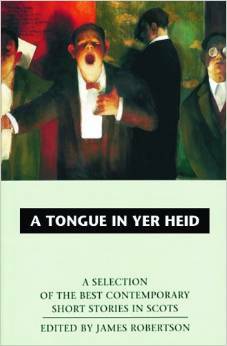 In the buik Robertson wrote the intro tae ‘A tongue in yer heid’, 75% o the text wis in whit A’d cry standart Scots! Ainlie aboout 15% wis in Glesca/Embro urban (tho e’n there wi muckle Scots embeddit). The lave in Scots Doric or a English/Scots mixter. In maugre o Robertson’s apenin pluralistic haun-wringin, maist o his ain scrievers were sel-selectin a standart. Robertson’s case wis ower-statit frae the ootset. He jist wantit tae elk twa-three stories, ane that stairit in English an ended up in Scots, and twa mair in ‘Glesca’ an ane in the Doric. Aw thon rigmarole wis just tae lat thae anes in frae a ‘artistic’ perspective. Pruives the pynt a aften mak that fowk write in a 80-90% standart awreddies. Mairower here a academic (Silke Stroh) pittin the bit intae faux-pluralism. No anent Scots, but cuid be. She [Stefanie Lehner in the 2012 buik “Subaltern Ethics in Contemporary Scottish and Irish Literature”) also criticises postmodern and post-national approaches that celebrate pluralism and inclusiveness while neglecting continuing conflicts and power imbalances, prematurely deconstruct subject positions before these are even possessed by the margins (where strategic essentialism may be required), and appropriate all difference for their own totalising theoretical purposes. Ahint the academic jargon abune is the idea that ‘pluralism’ soons liberatin but isna. Gin Scots canna big (or by ma wey o’t recognise) a aesome stannart and status it canna win the maucht tae tak on thaim wi pooer (an siller). An ower-focus on dialects an enless orthographic haiverin keeps Scots waik, pooerless an thraitent. Sae A doot A’m wi John M Tait on this ane!